The open loop ‘hybrid ready’ with water cleaning scrubber units are to be fitted onboard 10 of its IMOIIMAX MR tanker series, five Suezmaxes, and one standard MR ship. The investment, worth a total of US$55 million, is estimated to have a payback period of between 1.5 and 2.5 years. Removing sulphur as well as particles from the exhaust, the open loop scrubbers – which are the most popular gas cleaning systems – will ensure the vessel complies with the IMO’s new emissions rules. The new regulation requires scrubbers to be installed onboard vessels or for a more expensive fuel, that is compliant with the maximum sulphur content of 0.50%, to be used. Although a number of ports, including Singapore, have announced local bans on open loop scrubber discharge wastewater, IMO has made no formal decision and is encouraging member states to continue researching their environmental impact. In its announcement, the shipping group pointed to the growing concern of fuel availability as part of its reasoning for choosing scrubbers. “We evaluated the different options and came to the conclusion that for our business by installing scrubbers we will secure greater availability of fuel for our vessels and by so limit our exposure to not finding the right fuel around the world and by that stay flexible in our trading”, said the company’s President and CEO Erik Hånell. 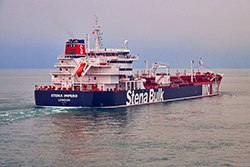 Stena Bulk’s sister company, Stena Line, also recently reversed its decision to retrofit a 38,000 gt ro-pax ferry, the Mecklenburg-Vorpommern, for LNG. The decision to halt its first dual-fuel retrofit came despite of the fact the company received funding from the German government to finance the project. Stena Line stated that the project would not be carried out due to “budge, technical challenges and both operational and financial risk”. Had the conversion of the 22-year-old vessel continued, the ship would have become one of the oldest vessels to be upgraded for LNG. It is thought, however, that the Mecklenburg-Vorpommern’s age was part of the reason for opting out of the retrofit, as a vessel’s age can affect the viability of conversion and supply a limited payback time.